There something I love about the coming back of winter every year, it's the so called "winter food". In other words dishes that are considered too heavy (like sauerkraut for instance!) or too hot to be eaten in summer. 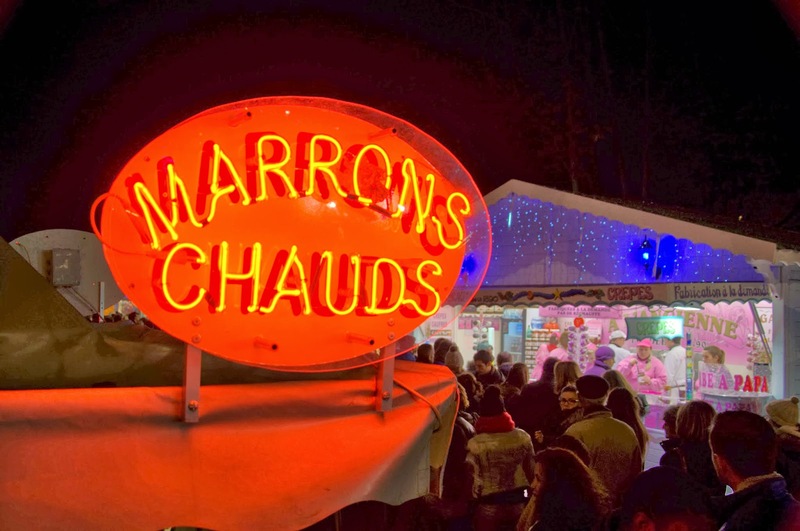 One of them is Marrons Chauds (roasted Chestnuts) that are sold everywhere in Paris during winter, especially outside the large department stores or on the Christmas markets, where I took this photo. I love them! There's a place here that sells them in the winter.... a street vendor. Strangely, I've never tried them. In New York City also. I remember there used to be hot chestnut sellers on the east side of Central Park, right outside the park on Fifth Avenue and on Central Park West. It was one way to tell it was winter. My dad loved them. I loved the smell, but I never liked the texture. Too soft and mushy inside for me, then. Of course, it was the chestnuts that were hot, not the sellers.